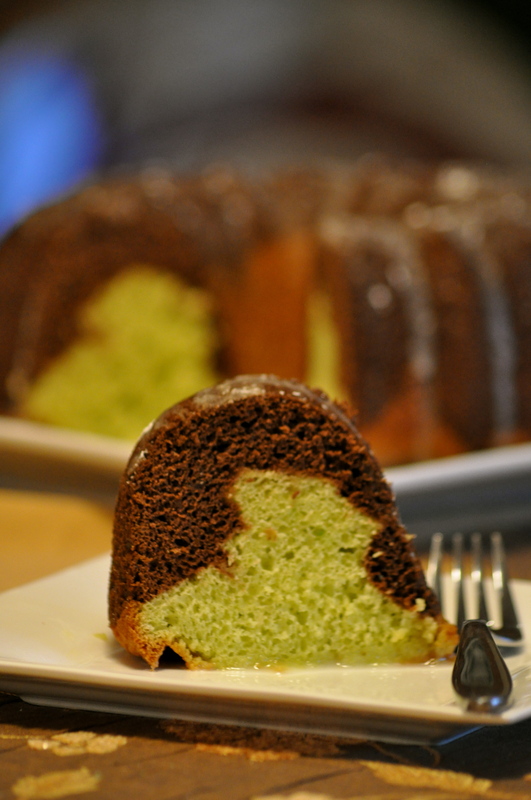 Chocolate Pistachio Bundt Cake aka Box, Can, Bam! 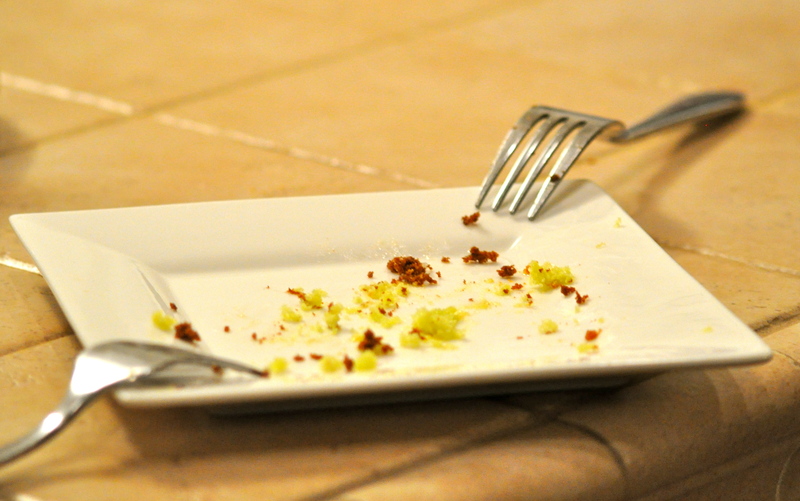 This is what happens when Elesha and I are taking pictures of The Cake. My friend Elesha came over during the Christmas break to share a favorite recipe. I first had this cake around ten years ago when I first met my friends Chris and Elesha and I couldn’t believe how great it is. I’ve been waiting for just the right moment to demand that Elesha share her family recipe and that time finally came during Christmas break. I simply refer to this when I’m talking to Elesha as “The Cake.” It’s just that good! This cake is also a perfect example of what our husbands call, “Box, Can, Bam!” When Elesha and I cook, it tends to come from a box, or a can and there is often some canned biscuits involved (Bam!). Sometimes we have all three in one meal! The thing about Box, Can, Bam is that it’s easy and usually pretty tasty. So, our husbands can make fun of us all they want, but they usually eat it right up! Elesha and I have been planning a few Box, Can, Bam recipes to share and this is the first one we’ve had time to do so far. So, keep a look out for more of our tasty creations. We’re gonna show those boys how it’s done! Preheat oven to 350 degrees (or, follow the directions on the box). Mix Yellow cake per directions on the box. Divide the cake batter into two equal parts. 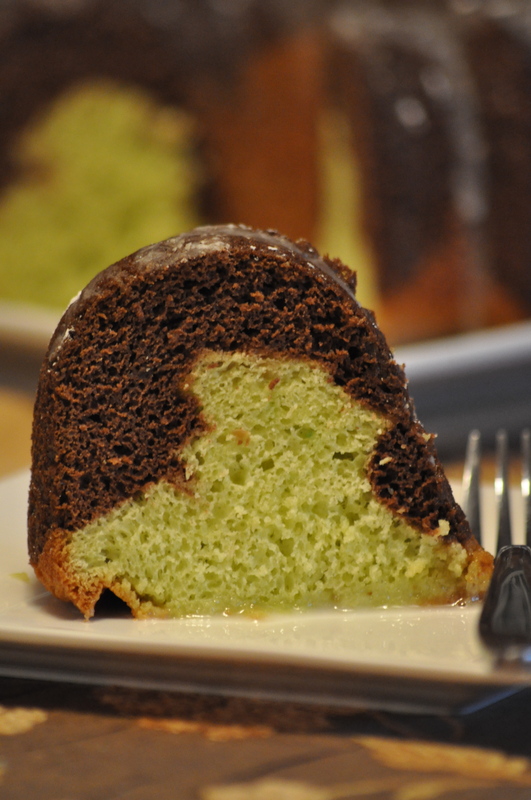 In one bowl, add the Pistachio pudding mix to the cake batter and mix until blended. Then, add the chocolate pudding mix to the other bowl and mix well. A note from Elesha: If you mix the pistachio side first, you don’t even have to clean the beaters between mixings. She is efficient like that! Then, take a bundt cake pan and spray it generously with non-stick spray. Pour in chocolate or pistachio – whichever you want on top. The pictures above are chocolate first and pistachio last. When you have the two layers completed, place in the oven for the recommended time on the box. Because of the moistness from the pudding mix, it may take longer to cook completely. Just check by inserting a toothpick until it comes out clean. Allow cake to cool completely and then turn out onto a plate. Serve plain or with a glaze/icing of your choice. We added a lemon glaze to this one. The glaze was simply one cup of powdered sugar with ½ a lemon squeezed into it and 1 ½ tablespoons of milk. It should be corrected now. Less wine and more proof reading eh? Lindsey! I think the Pioneer Woman probably got her recipe right the first time cuz she’s a professional and all! Strange we posted this at the same time. Loved the article. And now that I along with Loretta Lynn are some kind of Blog Phenom. I guess I’ll have a good year. The cake looked great. What’s wrong with box, can, Bam?